A lush selection of blushing pinks displayed in a bubble bowl. We create beautiful pink flower arrangements, get well arrangements, pink arrangements in bubble bowl with pink roses for any occasion. 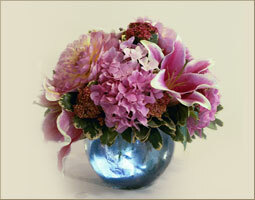 We will have your birthday flowers promptly delivered in Beverly Hills, West Hollywood, Santa Monica and greater Los Angeles area.